The highly religious typology groups – Sunday Stalwarts, God-and-Country Believers and the Diversely Devout – tend to have positive views of churches and other religious institutions. Majorities in each of these groups say that religious organizations strengthen morality, bring people together and do more good than harm. By contrast, the nonreligious groups – the Solidly Secular and especially the Religion Resisters – are far less positive about the role organized religion plays in society. A majority in each group says that churches have too much influence in politics, and substantial shares say religion pushes people apart and does more harm than good. 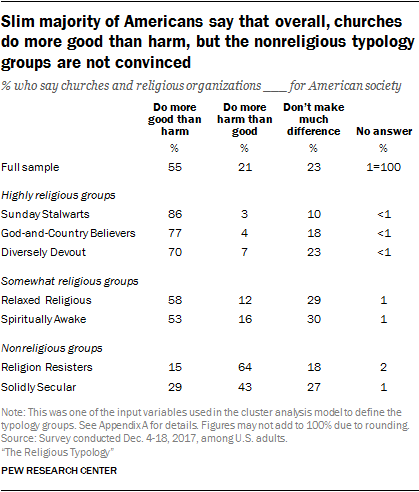 Among both the Relaxed Religious and the Spiritually Awake, half or more say churches do more good than harm for American society, while far fewer see churches as primarily harmful. But on many measures, the Relaxed Religious are somewhat warmer toward religious institutions than are the Spiritually Awake. Overall, 45% of U.S. adults say they have a mostly positive view of churches and religious organizations. Fewer (23%) say their views toward these institutions are mostly negative, and about a third (32%) view churches in a neutral light. But the balance of opinion varies widely across the religious typology groups. Clear majorities of the highly religious groups view religious organizations in a mostly positive manner. Sunday Stalwarts in particular stand out: 78% say their views of churches are mostly positive, compared with 66% of God-and-Country Believers and 61% of the Diversely Devout. About half of the Relaxed Religious (51%) also say they have a mostly positive view of churches and religious organizations, while 37% say their views of such organizations are neither positive nor negative. Among the Spiritually Awake, 45% say their views toward religious organizations are neutral, while 38% view these institutions positively. Among the nonreligious groups, nearly six-in-ten Religion Resisters (57%) and about half of the Solidly Secular (52%) hold mostly negative views of religious institutions. About a third in each group say they view these organizations in a neutral manner, while far fewer have positive feelings toward religious groups. The survey also asked a few questions about specific roles religious institutions may play in society, including their impact on the country’s moral fabric, their involvement in politics and their role in uniting or dividing people. Majorities among the highly religious typology groups – ranging from 69% among the Diversely Devout to 88% of Sunday Stalwarts – say churches and religious organizations strengthen morality in society. The balance of opinion among the Relaxed Religious also leans toward the view that churches strengthen morality (56%). The Spiritually Awake, meanwhile, are evenly divided between those who say religious institutions strengthen morality (43%) and those who say religion doesn’t make much of a difference with regard to society’s moral fabric (44%). 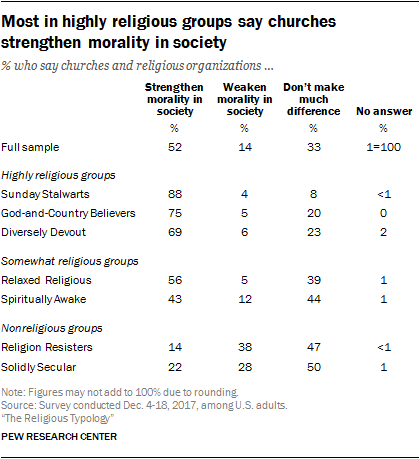 Religion Resisters are more than twice as likely to say that religious organizations weaken rather than strengthen morality in society (38% vs. 14%), with an additional 47% saying they don’t make much difference. A similar share of the Solidly Secular (50%) say churches don’t really impact the level of morality in society, but the remainder are more closely divided between those who say religious institutions strengthen (22%) and weaken (28%) morality. Four-in-ten U.S. adults say churches and other religious organizations have too much influence in politics. A quarter say these groups do not have enough influence, while a third say religious institutions have about the right amount of influence in the political sphere. Large majorities of Religion Resisters (82%) and the Solidly Secular (75%) say religious organizations have too much political clout. Others in these groups (14% and 20%, respectively) say that churches’ current level of religious influence in politics is where it should be, while very few say religious institutions should have more political influence. 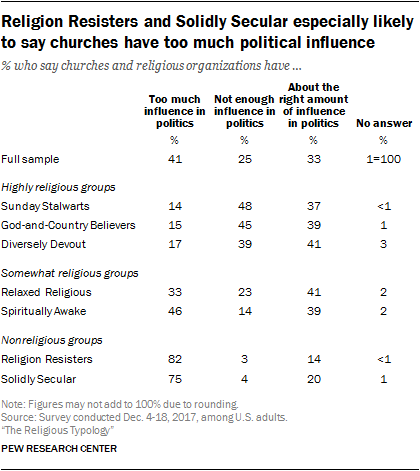 At the other end of the spectrum, just one-in-five or fewer among the highly religious typology groups say churches have too much political influence, while about four-in-ten or more say religious organizations do not have enough influence in politics. About half of American adults (49%) say churches and religious organizations mostly bring people together, while a quarter (23%) say they largely push people apart. Another 27% say religious institutions neither unite nor divide people. Sunday Stalwarts are especially likely to say churches play a positive role in bringing people together (82% vs. 5% who say religious institutions mainly push people apart). Clear majorities of God-and-Country Believers (69%) and the Diversely Devout (61%) also credit religious organizations with bringing people together. 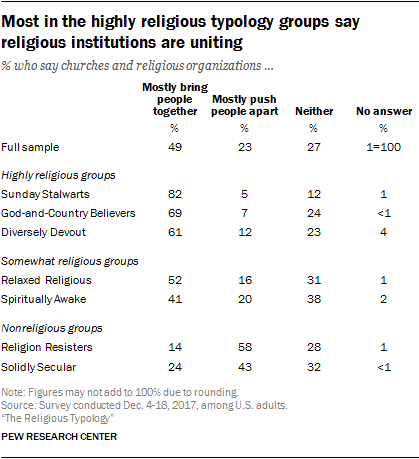 By contrast, Religion Resisters are the most likely of the typology groups to say religious institutions are primarily divisive. A majority in this category (58%) say churches mostly push people apart, compared with just 14% who say religious institutions mostly bring people together – the lowest of any group. A slim majority of U.S. adults (55%) say that, on the whole, churches and religious organizations do more good than harm in society, while 21% say they do more harm than good and 23% say they have a neutral impact. Half or more of those in the highly religious and somewhat religious typology groups say that religious institutions do more good than harm, and the remainder in each of these cohorts is more likely to say that churches don’t make much of a difference in American society than to say that churches do more harm than good. On the other hand, nearly two-thirds of Religion Resisters (64%) express the view that churches do more harm than good. A plurality of the Solidly Secular (43%) also say that religious institutions do more harm than good in American society, although about three-in-ten in this category (29%) take the opposite perspective (saying organized religion does more good than harm in the U.S.) and 27% say religious organizations do not make much difference one way or the other. Quiz: What is your religious typology?